Norwegian’s ship the Epic certainly does not live up to its name. If you’re considering a cruise on Epic, grab a cup of coffee, and I’ll fill you in on my experience. In the spirit of full disclosure, you should know I have never been seasick a day in my life, but I was nauseous for most of this voyage. When we sought Pepto or Dramamine, we were informed those OTC meds were only available from the ship’s doctor. A doctor visit would cost me $150. Needless to say, I waited until we went ashore and looked for Pepto then. Whether it is the ship or changes in my body that led to the physical misery of this trip, I have no way of knowing, but based on the rather large number of people constantly lined up outside the doctor’s office, I would say I wasn’t alone. While I suffered nausea, another member of our party decided to drink tap water instead of bottled water on the trip. A younger female, she returned home with a great deal of leg swelling, which she was told later was caused by the high concentration of salt in the tap water on the ship. Buy a bottled water package if sailing on Norwegian. Norwegian’s Website: Let’s start where the problems really began – prior to boarding! I booked the cruise through a third party, but once the reservation was in the Norwegian database, I was free to add tours/excursions, food packages, and drinks, or so I thought through the NCL websitee. The only thing I was able to successfully complete on their website was adding the soda and water package. After that I tried to book an excursion. After struggling with the NCL website, I ended up calling them. I waited on hold for 20 minutes before speaking with someone who could help me. When I had paid for the excursion and finished that entire process, I mentioned to the person on the phone that my daughter, who is now over 21, was still showing up on our materials as a Child. I was transferred to another department, and they resolved the issue with my daughter. All done? Nope! Two days later, my credit card notified me that the funds for the excursion had been refunded! No notice from NCL! No explanation. I called NCL back (and waited another 20 minutes) and was told they didn’t know why the excursion had been cancelled, but it appeared to have been connected to the transfer of my call to get my daughter’s status updated after I had already paid for two adults to take the excursion. They rebooked the excursion, and I paid for everything again. Not awful but annoying. Next, I booked and paid for an Upgraded Dining Package. You will want one of these. It’s the only food on the ship that we enjoyed. First I added the package to my cart on the NCL website, but it didn’t appear in the cart. Grrrrrr… Then I added it again. Now four packages were in the cart instead of two. Of course! I deleted two of the packages, but the website wouldn’t update. I waited and waited. They tell you it will take ten minutes for the shopping cart to show changes. Still, after ten minutes there were four packages in my cart. I left the website and came back and started again another day. This time I knew better, and I only added the two dining packages one time. There was nothing else in my shopping cart. 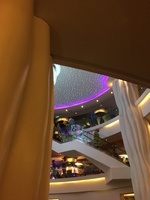 I paid for the dining packages and was rather pleased that I had successfully used the website, except… When we went to use the upgraded dining packages on the ship, no evidence of their purchase could be found! I ended up repurchasing the packages at the shipboard price. NCL, a company your size needs a website that is flawless and works every time. If your inhouse people can’t make it work, I know some terrific companies that will take over the maintenance and development of your website and give your users a wholly reliable experience. Happy to give you their number! Embarkation: We departed from Port Canaveral in January. It was an extremely hot day, and we stood in a line that wrapped around the front of the ship for 2 hours. We arrived at around 1 PM, and apparently so did everyone else. If you’re not interested in a long wait, come much earlier or much later. Air Conditioning: The Epic is kept at a cold temperature. It was a necessity for one member of our party to have a sweater everywhere we went accept the Pool Deck. Other members of our group had to have jackets or coverings to sit in the restaurants. Pack plenty of long-sleeved shirts and/or jackets and sweaters, and you should be fine. Food: The food on the Epic was not good. Everything that’s fried is drenched in oil. Eggs and bacon are undercooked, pancakes, waffles, and breads are bland, lines and waits at sit-down restaurants are unbelievably long, and if you find one thing you like or can eat, you get sick of it by the time you’ve had it every day of your cruise. If you plan to eat in the sit-down restaurants, make your reservations as soon as you get onboard. We went to Taste the first night and waited 50 minutes for a seat because we didn’t have a reservation. We went back another night when we had a reservation and waited 10 minutes for drinks after we were seated, another 10 minutes to have our order taken, and at least 15 minutes for the food to come. If you are not ordering alcohol, you will not get the same attention as diners who are. Here’s a story that perfectly illustrates food service aboard the Epic: My daughter is not a fan of breakfast food, so one day we slept late and decided to get an early lunch. There is one restaurant onboard that is supposed to serve lunch at 11:00 AM – O’Sheehan’s. We went down at about 10:55 AM, stood in line, and put our name in for lunch. We were seated and given breakfast menus, and our waiter came to ask for our drink order. We then told him the drinks we wanted and asked for lunch menus. He looked at us liked we’d grown two heads. (There’s a lot of that judgmental attitude from the crew on this ship!) The waiter told us they were still switching from breakfast to lunch and that it would be a few minutes. We told him that was fine. We noticed other diners around us ordering lunch food, but they were also ordering alcohol. The waiter had to get their alcohol, and that meant he could also get a tip from them when they cashed out. We continued to wait. Finally at 11:25, we ordered lunch from the restaurant that, according to their own materials, had been serving lunch since 11 AM. Our food did not arrive until 11:45! Again, other diners received more attention because their meal included alcohol. My daughter had ordered a burger and wanted mayonnaise on it, but the waiter dropped it off and disappeared. After waiting another 10 minutes, I went to the hostess desk and asked them for mayo. It was a full hour from arrival until we could actually start eating! If you’re prepared for that kind of delay and don’t mind the attitude, or if you’re a drinker, you should be fine on Epic. Cabin: The cabins on Epic are poorly designed, and everyone onboard talked about it with amazing regularity, as in ‘How did they come up with such an asinine design?’. 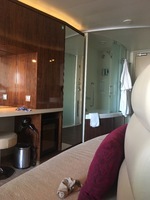 You see, when you enter your cabin, the toilet is off to your left, and the shower is to your right. They are both behind thin, opaque glass just inside the door of your cabin. They each have a sliding door to allow your passage in and out of the commode/shower and the rest of the cabin. 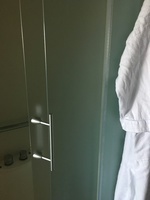 However, when your room steward comes, as he inevitably will, when you are on the commode, you cannot get to the door quickly enough to stop him, and he will be able to see what you’re doing and where you are because of the opaque glass. It is a horrible feeling, and if you have a shy bladder, you will find this arrangement most disconcerting. One member of our party would only use the public restroom two flights below our cabin to ensure some modicum of privacy. If you are in the cabin when someone is in the bathroom, you will hear and share every moment of their experience. If you aren’t shy about these things then it won’t bother you, but from scuttlebutt on the ship, I’d say you’d be in the minority. Pools: The three pools on the Epic were accurately described by a fellow traveler one night at dinner as “postage stamps”, and I would say that might be just a bit generous. There may be room for 10 adult people to stand in each of the pools, but you certainly will not be able to cram in more than that, or heaven forbid, to swim! They are difficult to get to, the water is cold, and they are cramped. “The pools are the most worthless parts of the ship. Why bother?”, was the opinion of one woman near me on our first day at sea. Needless to say, you will also find it hard to get a chair on the pool deck at high traffic times like days at sea, but you will be used to it, because you’ll never be able to find a seat in the buffet area at lunch or dinner time either. Casino: We would have loved to play the slots or maybe a hand or two of Black Jack, but please? Epic allows smoking in the casino, and it smelled like the bottom of an ashtray for the entire trip, so we passed. Passengers: The general age of Epic passengers was just north of Noah and south of Methuselah. There were more motorized scooters and walkers than I would have thought possible. They clog the elevators and buffet area, and heaven help you if you get behind some wobbly old lady with a cane. It will take you twice as long as it should to get anywhere. If you’re travelling with young people, there will be no one else for them to spend time with. Break down and buy the expensive WiFi package, or they will hate you for the whole trip. Norwegian likes to advertise themselves as being a pretty young, hip cruise company, but I’m starting to wonder if there is such a thing. Entertainment: You need to know now that unless you purchase premium seats for Cirque Epicurean, you will have obscured seating. Much of the performance takes place above the stage, and you can’t see much if you are both tall and seated in the back. They do not tell you when you purchase the seats that you are getting obscured seating, so either ask, or expect to miss quite a bit. The food for this dinner theater performance was a disgrace. The salad, an under-ripe sliced tomato with Mozzarella cheese and balsamic, included very salty prosciutto, and the entrée was a filet mignon that was so overcooked, it could have passed for shoe leather. There were three small desserts presented on one small dish, and my keen observation of the six people at my table indicated no one ate more than a single exploratory bite of any of the three, usually a sure sign of inferior flavor. I know I didn’t like mine. One couple at our table at Epicurean mentioned that she was going to see Priscilla: Queen of the Desert, another entertainment option, but her spouse wasn’t interested. I would imagine this is about par for the course considering the age and demographic of the travelers onboard the ship. Having a drag performance is probably not the best choice for middle American retirees. Older women won’t much mind the content, but older men are not known for being entertained by stories about drag queens. There was an ice bar onboard sponsored by Skyy Vodka, and we were interested in going and enjoying a cocktail one night and seeing what an ice bar is like. Then we discovered there was a $25 cover charge. On a ship we had already paid to be on! Each! Never mind. The one truly bright spot of the entertainment options is The Cavern Club, fashioned after the original in Liverpool, UK. Most nights, four energetic, talented young men do an excellent job of recreating the music and mayhem of John, Paul, George, and Ringo. On the nights the Fab Four aren’t playing, other gifted musicians recreate oldies hits and special requests that leave the entire audience cheering. This is a small club, and it fills up fast, so don’t let their late start time (10:30 PM) keep you from getting an early seat, and bring your dancing shoes. The Cavern Club is the most fun you’ll find onboard Epic. Exercise: There is no Promenade Deck on this ship. There is a Jogging Track, but they are very clear that unless you’re jogging, you shouldn’t be on the track. There are exercise facilities in the Spa area on Deck 14, but you will need to pay extra to access those facilities. Better plan to walk a lot on shore days to get some cardio in. Doors: Yikes! I know doors on ships have to seal completely to be safe, but the crew access door near our room was slammed constantly. I don’t know the rhyme or reason, but someone would come at 2 or 3 AM and other times throughout the night. Then at about 6:30 AM, more and more people would use the door. Everyone who went through either allowed it to slam behind them or purposely slammed it because we heard every time that door closed. Our fellow passengers seemed to do a good job of closing their stateroom doors quietly, but that crew access door kept a lot of people awake all night every night. Ship Maintenance: Regular ship maintenance is important and required to keep the ship looking good and operating at its most efficient. 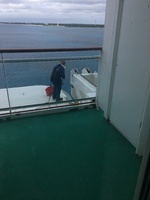 While we were onboard, they crew was chipping off old paint and then repainting the railings and other parts of the balcony. There was chipping and pounding for many days. Then one morning, our room steward showed up with three painters in tow at 8 AM. We had to allow the painters access to our balcony, and we scrambled to get dressed so we could leave the cabin for the rest of the day. The paint was smelly and annoying, not to mention the inconvenience of being awakened without warning and dragged out of our cabin. We were told before departure never to leave anything on the balcony because it could/would blow into the ocean and add to pollution there. Imagine our surprise then that the painters left a “Wet Paint” sign on the railing on the windiest day of the cruise. We brought it in and threw it away so it wouldn’t end up in the ocean. Disembarkation: Norwegian told us we would make port at 7:15 AM. We actually arrived at 6:30 AM, and the regular cruisers were already up and out of their cabins. If you want the crew to handle your luggage, you will put it in the hallway the night before, and you will not have access to it until late in the morning. If you wish to handle your own luggage, you can get off much earlier, but know that the elevators will be jammed with other people doing the same thing. I ended up dragging an 80-pound suitcase down the stairs to get to Deck 7, where we were lined up to disembark. I had naively believed we’d be able to get an elevator, but after waiting for 20 minutes and having people actually laugh in my face for trying to use the elevator, we opted for the stairs. Once we were off the ship, Customs moved us through pretty quickly, and we found our ground transportation and fled the port. Three days later, I am still sick to my stomach. Again, I can’t be sure what caused the nausea, but my research indicates it’s probably the lasting effects of seasickness. Summary: To say we weren’t impressed and didn’t have a great time onboard Epic would be a huge understatement. I will never cruise with Norwegian again and may never cruise the Caribbean again. Period. Feel free to ask questions if you’d like more specific information on this voyage. 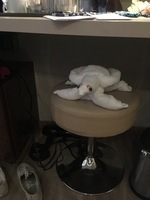 One of our towel animals. From the sofa/extra bed toward the shower. Norwegian’s ship the Epic certainly does not live up to its name. 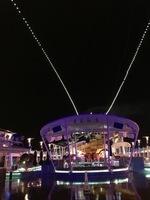 If you’re considering a cruise on Epic, grab a cup of coffee, and I’ll fill you in on my experience. In the spirit of full disclosure, you should know I have never been seasick a day in my life, but I was nauseous for most of this voyage. When we sought Pepto or Dramamine, we were informed those OTC meds were only available from the ship’s doctor. A doctor visit would cost me $150. Needless to say, I waited until we went ashore and looked for Pepto then. Whether it is the ship or changes in my body that led to the physical misery of this trip, I have no way of knowing, but based on the rather large number of people constantly lined up outside the doctor’s office, I would say I wasn’t alone. While I suffered nausea, another member of our party decided to drink tap water instead of bottled water on the trip. A younger female, she returned home with a great deal of leg swelling, which she was told later was caused by the high concentration of salt in the tap water on the ship. Buy a bottled water package if sailing on Norwegian. Norwegian’s Website: Let’s start where the problems really began – prior to boarding! I booked the cruise through a third party, but once the reservation was in the Norwegian database, I was free to add tours/excursions, food packages, and drinks, or so I thought through the NCL websitee. The only thing I was able to successfully complete on their website was adding the soda and water package. After that I tried to book an excursion. After struggling with the NCL website, I ended up calling them. I waited on hold for 20 minutes before speaking with someone who could help me. When I had paid for the excursion and finished that entire process, I mentioned to the person on the phone that my daughter, who is now over 21, was still showing up on our materials as a Child. I was transferred to another department, and they resolved the issue with my daughter. All done? Nope! Two days later, my credit card notified me that the funds for the excursion had been refunded! No notice from NCL! No explanation. I called NCL back (and waited another 20 minutes) and was told they didn’t know why the excursion had been cancelled, but it appeared to have been connected to the transfer of my call to get my daughter’s status updated after I had already paid for two adults to take the excursion. They rebooked the excursion, and I paid for everything again. Not awful but annoying. Next, I booked and paid for an Upgraded Dining Package. You will want one of these. It’s the only food on the ship that we enjoyed. First I added the package to my cart on the NCL website, but it didn’t appear in the cart. Grrrrrr… Then I added it again. Now four packages were in the cart instead of two. Of course! I deleted two of the packages, but the website wouldn’t update. I waited and waited. They tell you it will take ten minutes for the shopping cart to show changes. Still, after ten minutes there were four packages in my cart. I left the website and came back and started again another day. This time I knew better, and I only added the two dining packages one time. There was nothing else in my shopping cart. I paid for the dining packages and was rather pleased that I had successfully used the website, except… When we went to use the upgraded dining packages on the ship, no evidence of their purchase could be found! I ended up repurchasing the packages at the shipboard price. NCL, a company your size needs a website that is flawless and works every time. If your inhouse people can’t make it work, I know some terrific companies that will take over the maintenance and development of your website and give your users a wholly reliable experience. Happy to give you their number! Embarkation: We departed from Port Canaveral in January. It was an extremely hot day, and we stood in a line that wrapped around the front of the ship for 2 hours. We arrived at around 1 PM, and apparently so did everyone else. If you’re not interested in a long wait, come much earlier or much later. Air Conditioning: The Epic is kept at a cold temperature. It was a necessity for one member of our party to have a sweater everywhere we went accept the Pool Deck. Other members of our group had to have jackets or coverings to sit in the restaurants. Pack plenty of long-sleeved shirts and/or jackets and sweaters, and you should be fine. Food: The food on the Epic was not good. Everything that’s fried is drenched in oil. Eggs and bacon are undercooked, pancakes, waffles, and breads are bland, lines and waits at sit-down restaurants are unbelievably long, and if you find one thing you like or can eat, you get sick of it by the time you’ve had it every day of your cruise. If you plan to eat in the sit-down restaurants, make your reservations as soon as you get onboard. We went to Taste the first night and waited 50 minutes for a seat because we didn’t have a reservation. We went back another night when we had a reservation and waited 10 minutes for drinks after we were seated, another 10 minutes to have our order taken, and at least 15 minutes for the food to come. If you are not ordering alcohol, you will not get the same attention as diners who are. Here’s a story that perfectly illustrates food service aboard the Epic: My daughter is not a fan of breakfast food, so one day we slept late and decided to get an early lunch. There is one restaurant onboard that is supposed to serve lunch at 11:00 AM – O’Sheehan’s. We went down at about 10:55 AM, stood in line, and put our name in for lunch. We were seated and given breakfast menus, and our waiter came to ask for our drink order. We then told him the drinks we wanted and asked for lunch menus. He looked at us liked we’d grown two heads. (There’s a lot of that judgmental attitude from the crew on this ship!) The waiter told us they were still switching from breakfast to lunch and that it would be a few minutes. We told him that was fine. We noticed other diners around us ordering lunch food, but they were also ordering alcohol. The waiter had to get their alcohol, and that meant he could also get a tip from them when they cashed out. We continued to wait. Finally at 11:25, we ordered lunch from the restaurant that, according to their own materials, had been serving lunch since 11 AM. Our food did not arrive until 11:45! Again, other diners received more attention because their meal included alcohol. My daughter had ordered a burger and wanted mayonnaise on it, but the waiter dropped it off and disappeared. After waiting another 10 minutes, I went to the hostess desk and asked them for mayo. It was a full hour from arrival until we could actually start eating! If you’re prepared for that kind of delay and don’t mind the attitude, or if you’re a drinker, you should be fine on Epic. Cabin: The cabins on Epic are poorly designed, and everyone onboard talked about it with amazing regularity, as in ‘How did they come up with such an asinine design?’. You see, when you enter your cabin, the toilet is off to your left, and the shower is to your right. They are both behind thin, opaque glass just inside the door of your cabin. They each have a sliding door to allow your passage in and out of the commode/shower and the rest of the cabin. However, when your room steward comes, as he inevitably will, when you are on the commode, you cannot get to the door quickly enough to stop him, and he will be able to see what you’re doing and where you are because of the opaque glass. It is a horrible feeling, and if you have a shy bladder, you will find this arrangement most disconcerting. One member of our party would only use the public restroom two flights below our cabin to ensure some modicum of privacy. If you are in the cabin when someone is in the bathroom, you will hear and share every moment of their experience. If you aren’t shy about these things then it won’t bother you, but from scuttlebutt on the ship, I’d say you’d be in the minority. Pools: The three pools on the Epic were accurately described by a fellow traveler one night at dinner as “postage stamps”, and I would say that might be just a bit generous. There may be room for 10 adult people to stand in each of the pools, but you certainly will not be able to cram in more than that, or heaven forbid, to swim! They are difficult to get to, the water is cold, and they are cramped. “The pools are the most worthless parts of the ship. Why bother?”, was the opinion of one woman near me on our first day at sea. Needless to say, you will also find it hard to get a chair on the pool deck at high traffic times like days at sea, but you will be used to it, because you’ll never be able to find a seat in the buffet area at lunch or dinner time either. Casino: We would have loved to play the slots or maybe a hand or two of Black Jack, but please? Epic allows smoking in the casino, and it smelled like the bottom of an ashtray for the entire trip, so we passed. Passengers: The general age of Epic passengers was just north of Noah and south of Methuselah. There were more motorized scooters and walkers than I would have thought possible. They clog the elevators and buffet area, and heaven help you if you get behind some wobbly old lady with a cane. It will take you twice as long as it should to get anywhere. If you’re travelling with young people, there will be no one else for them to spend time with. Break down and buy the expensive WiFi package, or they will hate you for the whole trip. Norwegian likes to advertise themselves as being a pretty young, hip cruise company, but I’m starting to wonder if there is such a thing. Entertainment: You need to know now that unless you purchase premium seats for Cirque Epicurean, you will have obscured seating. Much of the performance takes place above the stage, and you can’t see much if you are both tall and seated in the back. They do not tell you when you purchase the seats that you are getting obscured seating, so either ask, or expect to miss quite a bit. The food for this dinner theater performance was a disgrace. The salad, an under-ripe sliced tomato with Mozzarella cheese and balsamic, included very salty prosciutto, and the entrée was a filet mignon that was so overcooked, it could have passed for shoe leather. There were three small desserts presented on one small dish, and my keen observation of the six people at my table indicated no one ate more than a single exploratory bite of any of the three, usually a sure sign of inferior flavor. I know I didn’t like mine. One couple at our table at Epicurean mentioned that she was going to see Priscilla: Queen of the Desert, another entertainment option, but her spouse wasn’t interested. I would imagine this is about par for the course considering the age and demographic of the travelers onboard the ship. Having a drag performance is probably not the best choice for middle American retirees. Older women won’t much mind the content, but older men are not known for being entertained by stories about drag queens. There was an ice bar onboard sponsored by Skyy Vodka, and we were interested in going and enjoying a cocktail one night and seeing what an ice bar is like. Then we discovered there was a $25 cover charge. On a ship we had already paid to be on! Each! Never mind. The one truly bright spot of the entertainment options is The Cavern Club, fashioned after the original in Liverpool, UK. Most nights, four energetic, talented young men do an excellent job of recreating the music and mayhem of John, Paul, George, and Ringo. On the nights the Fab Four aren’t playing, other gifted musicians recreate oldies hits and special requests that leave the entire audience cheering. This is a small club, and it fills up fast, so don’t let their late start time (10:30 PM) keep you from getting an early seat, and bring your dancing shoes. The Cavern Club is the most fun you’ll find onboard Epic. Exercise: There is no Promenade Deck on this ship. There is a Jogging Track, but they are very clear that unless you’re jogging, you shouldn’t be on the track. There are exercise facilities in the Spa area on Deck 14, but you will need to pay extra to access those facilities. Better plan to walk a lot on shore days to get some cardio in. Doors: Yikes! I know doors on ships have to seal completely to be safe, but the crew access door near our room was slammed constantly. I don’t know the rhyme or reason, but someone would come at 2 or 3 AM and other times throughout the night. Then at about 6:30 AM, more and more people would use the door. Everyone who went through either allowed it to slam behind them or purposely slammed it because we heard every time that door closed. Our fellow passengers seemed to do a good job of closing their stateroom doors quietly, but that crew access door kept a lot of people awake all night every night. Ship Maintenance: Regular ship maintenance is important and required to keep the ship looking good and operating at its most efficient. While we were onboard, they crew was chipping off old paint and then repainting the railings and other parts of the balcony. There was chipping and pounding for many days. Then one morning, our room steward showed up with three painters in tow at 8 AM. We had to allow the painters access to our balcony, and we scrambled to get dressed so we could leave the cabin for the rest of the day. The paint was smelly and annoying, not to mention the inconvenience of being awakened without warning and dragged out of our cabin. We were told before departure never to leave anything on the balcony because it could/would blow into the ocean and add to pollution there. Imagine our surprise then that the painters left a “Wet Paint” sign on the railing on the windiest day of the cruise. We brought it in and threw it away so it wouldn’t end up in the ocean. Disembarkation: Norwegian told us we would make port at 7:15 AM. We actually arrived at 6:30 AM, and the regular cruisers were already up and out of their cabins. If you want the crew to handle your luggage, you will put it in the hallway the night before, and you will not have access to it until late in the morning. If you wish to handle your own luggage, you can get off much earlier, but know that the elevators will be jammed with other people doing the same thing. I ended up dragging an 80-pound suitcase down the stairs to get to Deck 7, where we were lined up to disembark. I had naively believed we’d be able to get an elevator, but after waiting for 20 minutes and having people actually laugh in my face for trying to use the elevator, we opted for the stairs. Once we were off the ship, Customs moved us through pretty quickly, and we found our ground transportation and fled the port. Three days later, I am still sick to my stomach. Again, I can’t be sure what caused the nausea, but my research indicates it’s probably the lasting effects of seasickness. Summary: To say we weren’t impressed and didn’t have a great time onboard Epic would be a huge understatement. I will never cruise with Norwegian again and may never cruise the Caribbean again. Period. Feel free to ask questions if you’d like more specific information on this voyage. The cabins on Epic are poorly designed, and everyone onboard talked about it with amazing regularity, as in ‘How did they come up with such an asinine design?’. You see, when you enter your cabin, the toilet is off to your left, and the shower is to your right. They are both behind thin, opaque glass just inside the door of your cabin. They each have a sliding door to allow your passage in and out of the commode/shower and the rest of the cabin. However, when your room steward comes, as he inevitably will, when you are on the commode, you cannot get to the door quickly enough to stop him, and he will be able to see what you’re doing and where you are because of the opaque glass. It is a horrible feeling, and if you have a shy bladder, you will find this arrangement most disconcerting. One member of our party would only use the public restroom two flights below our cabin to ensure some modicum of privacy. If you are in the cabin when someone is in the bathroom, you will hear and share every moment of their experience. If you aren’t shy about these things then it won’t bother you, but from scuttlebutt on the ship, I’d say you’d be in the minority. Best money I spent on this trip! You will walk a few feet from the ship to a Mayan spa where you will soak in your swimsuit in herbal waters and experience the spiritual guidance of a Mayan priestess. 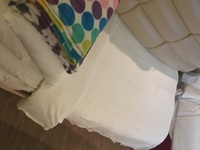 There is a short visit to a sauna, a cold water shower, a mud facial mask, and another relaxing soak before going to a nearby hammock for an unusual massage. We loved this experience and found it very relaxing and rejuvenating. Same grand shopping center that every cruise port seems to have become. Nothing special here. Other than the sticker shock for buying photos at the end of the day, we had a wonderful experience. Be aware - Photos are $30 each or $120 for all photos of a single couple. We opted for the $120 package, but you are not allowed to have a camera anywhere near the experience, so if you want photos, this is the only option. Water was cold in January, and many people in our group were uncomfortably cold. However, the stingrays never disappoint, and it's a fun encounter. Lovely! Would go back here and stay a week or 10 days. Charming people and beautiful clean beaches. One thing to be aware of here, there is a Landshark Bar & Grill, the only place to get food in Harvest Caye, and they DO NOT accept AMEX. I wasn't feeling well this day, and we had to return early from the tour. Sadly, we spent 10 minutes with the tour, and they never offered to refund my money or even part of it. Pushy, unfriendly vendors and poverty and squalor just beyond the shopping area. We were relieved we had NOT booked an excursion in this port as we would have been uncomfortable leaving the pier.